This phony website was created to look like the real Netflix. If you log in, you’ll be giving your personal information to con artists. Scammers often use the names and logos of legitimate businesses to try to trick consumers. This time around, the victim is Netflix, the popular streaming service and home to hot shows like Stranger Things, G.L.O.W. and Master of None. And you could be sucked in as a victim, too, if you fall for this scam. 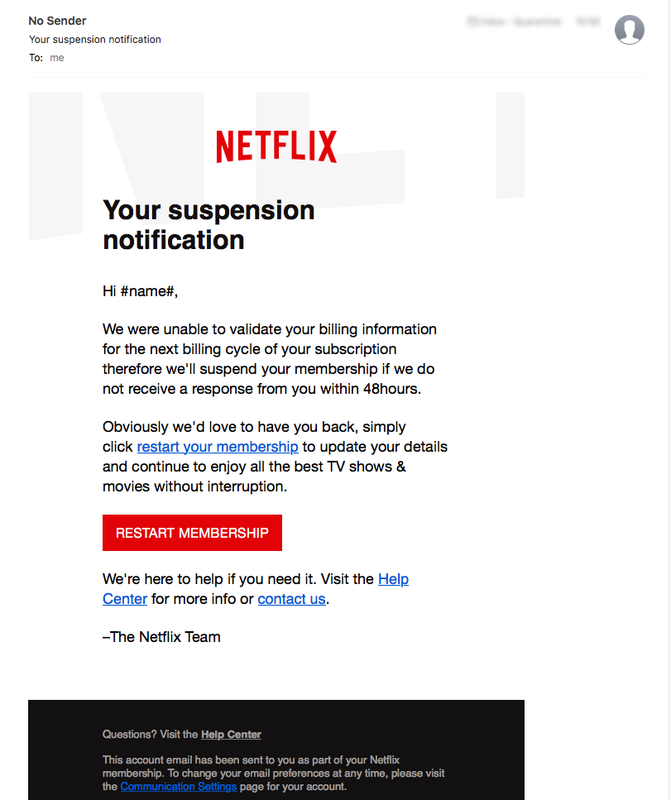 Customers and non-customers alike have been reporting they’ve received emails that look an awful lot like official messages from Netflix. One of the many fake emails sent by Netflix impersonators as they try to steal your personal information. There are other variations, but what they all have in common is that they’re scams. Phishing attempts. The emails all include links for the user to click to visit the Netflix site and update credit card information. But of course, the link doesn’t go to the real Netflix site, but an impersonation — a really, really good impersonation. If you visit a fake site, the scammer will get your login and password, and whatever else you enter into the site, such as your credit card number. Some reports say some of the phony sites even ask for your mother’s maiden name and driver’s license number. Once the scammer has your information, they can take your credit card number and go shopping. Or use your other private details to apply for fake loans in your name and otherwise steal your identity. And if they have your login and password, you can assume they may try to use it on other sites because most people — despite warnings — use the same password for everything. We asked Netflix, which has 109 million subscribers to date, to share a copy of a real message it might send to a user who has a payment issue so we could compare the real thing with the fakes. The company didn’t offer any images for us to do a comparison, nor would it say how many complaints it’s received about the phony emails. It did say it takes security seriously. It then pointed us to its website, which offers tips on how to keep your personal account safe. The site said Netflix will never ask for personal information — including payment information or account passwords — via email. The company said it may email customers to tell them to update their personal information with a link to its website, but it warns you to be cautious of fake emails that may link to phony websites created to look like the real thing. To see where a link goes, simply hover your mouse over the link and you’ll see the web address it points to. If you’re not sure, don’t click. Instead, go to your browser and type in the real address. Netflix also recommends you use a password that’s unique to your account, and that you change it periodically. And if you receive what you think is a fake come-on, you can report it to phishing@netflix.com.